PLEASE Head on over to DrumConnection's Trip to Website for this year 2019 HERE! 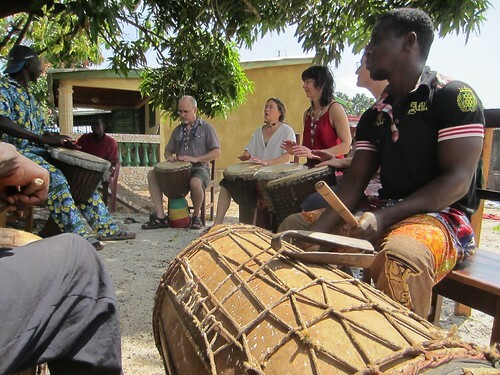 Join us for the trip of a lifetime, studying djembe and dunun drumming in Africa with Masters of the craft. A true cultural and musical immersion in Malinké music. 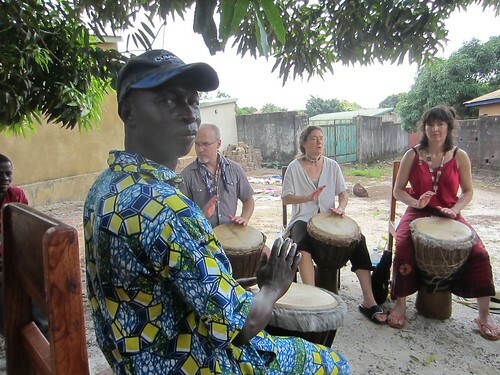 Boston area’s DrumConnection is hosting an unforgettable journey to the birthplace of the djembe. 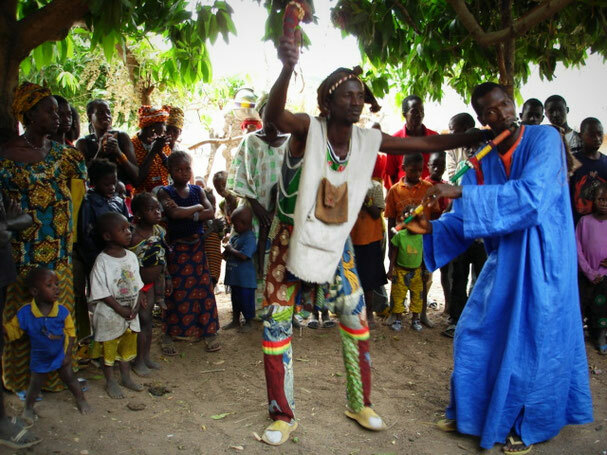 In this solid 3 week trip you will have the opportunity to immerse yourself in the music and culture of Guinea. Study drum and dance, attend festivals and celebrations, learn about the country and its people and discover the magic that IS Africa! This year, we have added some safari days and special attention to dance and balafon by the village drummers. "I have only studdied with Famoudou for a week in the United States a few years ago and have been hoping to travel to Guinea to study with him in his home. I am so excited to see this trip posted. I am signing up right now!" 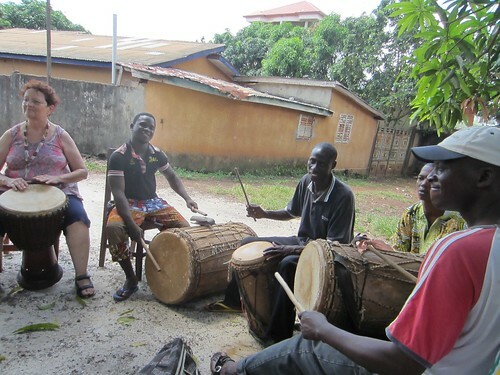 While we will be drumming quite a bit we will also experience traditional Guinean dance and experience the connection to Africa. Through this experience, we will grow as musicians and experience profound personal changes as we develop and explore our new relationships with our teachers, friends and the environment. The trip is for a solid 3 Weeks. (not including Airfare) We help you find best flight prices. -30 Day extended (balafon intensive with Abou Sylla Add $450.- to the above costs. You will be able to buy jewelry, fabric and visit tailors to have fitted close made for you, your friends and family and even your complete performance troupe! Some nights you will enjoy candlelight when there is no electricity. You will see the Moon and Stars like never before as we are very near the equator. The days are warm and it usually cools down a little at night with an ocean breeze. When you register you will receive detailed advice and support on what to bring in a comprehensive list that will be provided in a few emails. We can also send by post, if necessary. In memory of my good friend Rainer Dorer, friend to Famoudou and a man you should know about. ALAN TAUBER, (Boston, MA US) will be your host. This will be Alan’s fifteenth trip to Guinea. 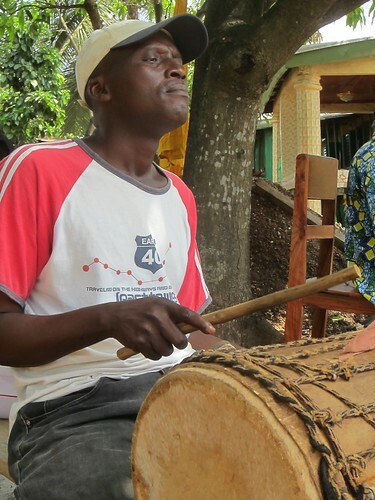 Alan has played and studied with Famoudou for over 20 years and assisted him in over 100 days of workshops! Alan will be available to you for any of your wishes or concerns from before you pack your bags to the day we come home once again. We will make your stay very enjoyable and be able to tailor (within reason) a workshop that will meet your needs. 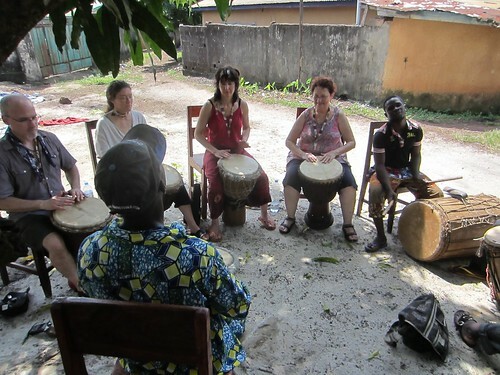 Over the course of three weeks, travelers may participate in group drum, dance classes five days a week. 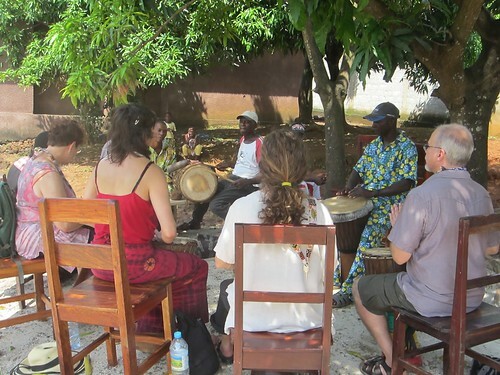 During your stay you may also attend balafon and/or Fula Flute classes as you wish and as available. We will be staying in an African village! 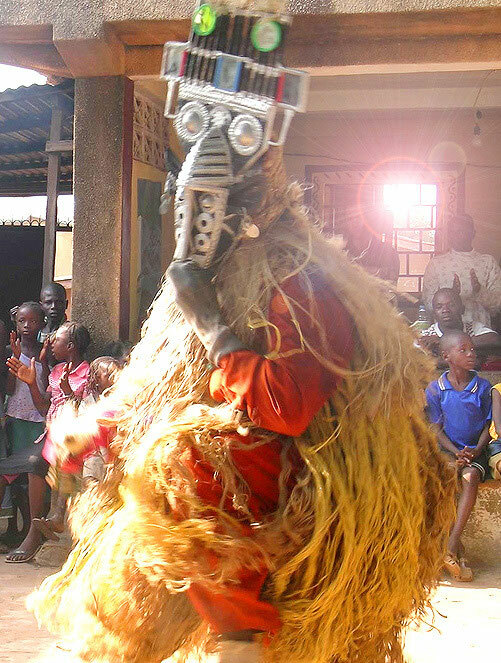 Oroko, Guinea. Traveling to Africa can seem hard or crazy to some people. It is best to do it in a safe and structured setting that we provide. What you will gain as a participant and traveler will, very likely, change your life. 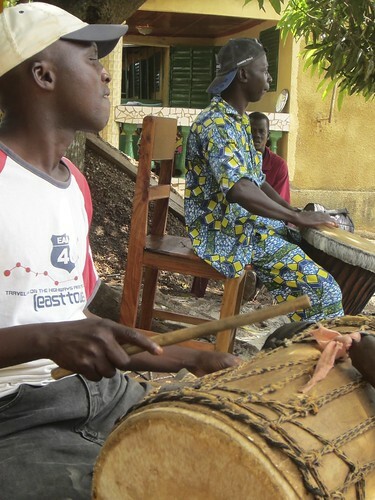 An immersion in the culture and music of Guinea like this is not to be missed. 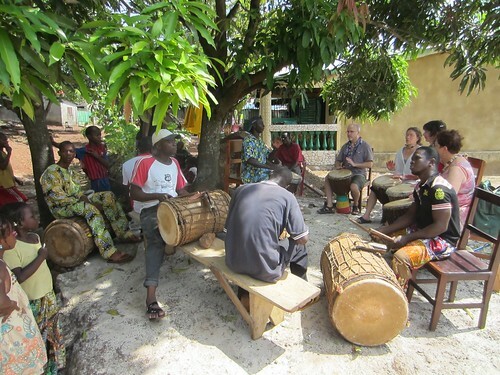 Our DrumConnection trip is designed for newbie travelers to Africa as well as veteran West Africa dancers and drummers. The experience is real and you will be safe. Guinea is so culturally rich, it will change what you believe about the world and yourself. A trip of this nature will bring you into contact with perhaps some of the most open and generous people you have ever met. Though financially poor, these people have hearts as large as the widest seas! Please send us an email as soon as possible to let us know of your interest in this tour. There are some meetings (optional) that give you a great idea of what to expect and how to prepare. Upon request, we will email you a registration form to get you started. The food will be traditional African fare based on rice with a variety of sauces or traditional fare. You may enjoy chicken, beef, goat and lots of fresh fish from the Atlantic. There are always fresh vegetables and delicious fresh fruit. Vegetarian meals will always be available for you. Food will be prepared at the compound. The cooking goes on ALL day! If you like it spicy, we do spicy! Or tame, if you must. Classes in Drum or Drum and Dance will be 4-5 days a week. Many afternoons we will have dance classes as people wish. Drum Classes will include proper tone production, feel, relaxation, speed, rolls, solos, traditional rhythms, songs and the cultural context of the rhythms. We may add in a ballet style arrangement and definitely the echauffements! Dance classes will be available to those who want them and arranged during the part of the day when it is not as hot. Drummers may play for dance classes where appropriate. Balafon classes are also part of our tour as is the flute. These classes will be set up depending upon interest from you, our students. Every 3-4 days we will have the next day OFF. These OFF days may be perfect for further musical study with a specialist in the instrument you love or perfect for a vacation. • Transport on the ground in Guinea. • Lodging, based on double occupancy or single may be available. • Breakfast, lunch and dinner prepared exqusitly local chefs to your liking. 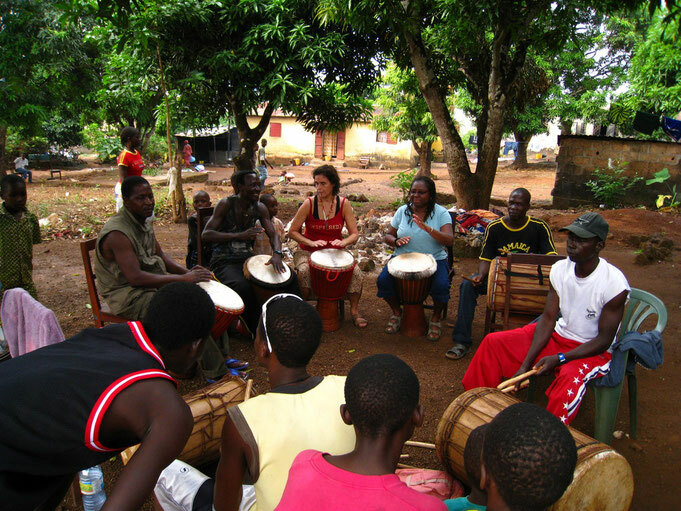 • Drumming classes 5 days a week, dancing, balafon and language classes arranged by request. (sometimes, a little extra or a tip). Plan to bring spending money for expenses not covered and purchases you may make during your stay. A $500.- deposit is required to secure your spot on the trip. Deposits must be received by December 10, 2018. PLEASE Head on over to Website for this year 2019 HERE! DrumConnection Trip to Guinea 2012 with Mamady Kourouma, Instructor and students. Food when we are away from the compound is slightly extra. Probable side trips in taxis and the like and your airfare is not included in the price. Airfare is from $999 RT to $1650 RT depending on where you are departing from. The cost of obtaining a passport and visa are not included in the tuition. All the above ‘not includeds’ are not much more cost. Pocket change. We will supply you with a very small, powerful flashlight, a microfibre cloth for cleaning glasses or camera lenses, and more. Most importantly we will give you all the information you need in easy to do steps that make this trip doable! Money can be kept in a safe or hidden well in your room. •You must have a letter of invitation from Mamady Kourouma (Wadaba) for this trip. •You must get your documents in order. We will help with all of it. •You must have a passport and a visa to enter Guinea. •Yellow Fever vaccination is required. We recommend consulting a travel clinic in your country. •Other vaccines may be warranted. Speak with your PCP or a travel clinic at your local hospital. The weather conditions Guinea in the interior, in the area we'll be, is beautiful. The days are warm (hot) and sunny and the nights are much cooler. There is a light breeze in the day and night. Prepare for warm conditions. Details will be sent to registrants to help you plan your trip. We will actually speak with all of you who have your deposits in by November 1, 2018. Or before. Please give us your contact info so we can initiate a conversation and answer any questions you may have. You must arrive on or after January 7,8 or 9, 2019 and leave the last day of the workshop on January 29, 2019. If you need flexibility with dates we can assist you. If you wish to stay on for a longer period of time, arrangements can be made. You can travel to another part of Africa or stay on with me and visit my family in Guinea. If you are so enthralled with Africa and would like to stay for a longer time, the cost will be $65 a day which includes your food and lodging. You can arrange lessons in drum, dance, other instruments or just enjoy some down time with your new friends there. Travel with us to Guinea . . . You will never be the same. ...I was amazed at the conversations I had with co-workers from Africa about family life, respect, and the difference between our cultures. Before I went to Africa the conversations alone changed my views of my own race. After I went to Africa.....It changed my life! from a drummer on her first trip to Africa. PLEASE Head on over to Website for this year 2018 HERE! 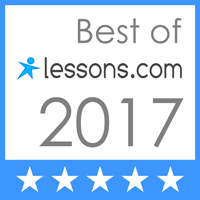 PLEASE Head on over to Website for this year 2017 HERE!